Lettuce Juice <3! Juicing Lettuce; Benefits, Flavors and Recipes. If juicing lettuce, spinach, or arugula does not sound too appetizing you may be happily amazed when you actually try it. When I mention adding a head of romaine to a juice usually friends are worried that there will be a strong earthy or “dirt”taste to their juice. If the produce is properly washed and fresh lettuce can add a nice sweetness and crispness. Arugula has a spicy bitter flavor that goes well with so far everything I have ever mixed it with in a juice. Red leaf lettuce does have a more distinct taste compared to green leaf lettuce or romaine. Out of these lettuces I’ve noticed I usually get less juice and more of a slightly earthy taste. I have many recipes using different types of lettuce on my site. Besides lettuce providing lots of water, thus more juice both romaine and red leaf lettuce are high in Vitamin K & Vitamin A. The American Institute for Cancer Research has identified romaine lettuce, among other greens, as containing cancer-inhibiting cartenoids. The mix of sulfur, chlorine, silicon, and B complex in romaine lettuce contributes to hair growth, healthy skin, and defense against lung cancer. Let’s not forget the energizing and blood-rebuilding chlorophyll found in Romaine, especially the dark outer leaves. All greens have this amazing chlorophyll but yes, the darker the greens the higher the quantity. Romaine is high in Vitamin C (38% in 2 cups) and has the highest amount of Vitamin A out of these greens (164% in 2 cups). Romaine, red lead lettuce, and arugula are all very low in calories. These all have beneficial levels of iron, magnesium, and calcium. Our body can store certain amounts of iron in the liver and spleen. Those elemental supplies are used in emergency cases, for example, for accelerated blood cells formation when there is blood loss or injury. In the spleen, iron serves, together with the other chemical compounds, as a recharging center for the blood. Lettuce, like almost all vegetables, possesses relatively low sodium content, which makes it a desirable ingredient. Lettuce, arugula and spinach are typically more affordable vegetables in the produce section and depending where you live they are normally very easy to grow in your own back yard. If you are interested in some lettuce based juices and you want something super sweet, I recommend trying out my Chocolate Milk Recipe. Lettuce, comes from the word lactuca the Latin word for milk because of the white milk-like substance that seeps out of lettuce like blood. Not all lettuce is created equal 😉 The common iceberg lettuce is almost nutritionally useless, compared to the deeper green and more nutrient-dense romaine lettuce. When it comes to greens, the darker the color, the richer the nutrients, and more distinct the flavor (like what I mentioned with red leaf lettuce). If you are preparing a lettuce juice for children or may be someone new to drinking fresh green juices try out romaine hearts. Their flavor and color when juiced is super smooth, and because the hearts are lighter the juice is sweet and lighter. One of my favorite juices is my Green Detox Juice. 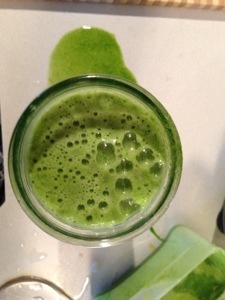 Yesterday I made a variation of this juice with different greens and less fruit. Instead of using kale and spinach I used a romaine heart and arugula. I highly recommend rotating all your fruits, vegetables, herbs, nuts and seeds. But greens especially! The alkaloids can build up and each food has amazing benefits, flavors, and textures that can not be found in other foods. « More On Asparagus, Purple Asparagus Information. Blueberry GreaterAde Recipe.